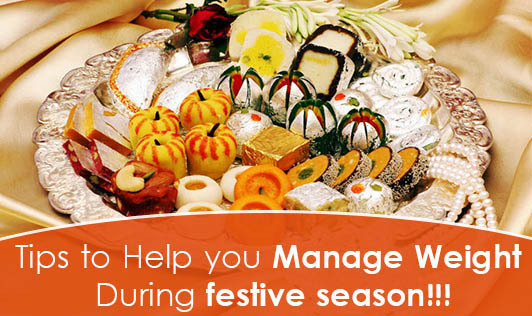 Tips to help you manage Weight during festive season!!! • Have realistic goals - Consider yourself successful if you have maintained your weight. • Go slow on sweets. Avoid fried sweets and opt for sweets made out of paneer - eg, Bengali sweets. At least they are high in protein. • Try and make sweets at home rather than buying it from a sweet shop. This way you can modify the recipes to make it healthy and low calorie....yet delicious!!! • Jaggery based sweets are a better option compared to sugar based ones...nutritional value of jaggery is higher than sugar. Alternate with skimmed milk and low fat creams where milk and cream is asked in the recipe. Also low calorie sugars or artificial sweeteners used instead of regular sugars. • Put away festive sweets and snacks out of sight after meal times- clear the dining table from those tempting foods. Do not eat sweets as an excuse- thinking it might go for a waste. • Make sure you eat your meals regularly instead of skipping them. This will reduce the likelihood of you binging on sweets and snacks later when hungry. • Go easy on dry fruits and nuts. Choose to have them in the natural form than the fried, salted or sugared version. • Balance your intake of sweets and desserts by eating less rice and chapatis in the main course. At least you are not exceeding the calorie intake!!! • If you have to attend parties- eat light and low calorie snacks at home like a bowl of fruits, before you go for the party. This will reduce intake of all the rich, high-calorie foods served. Try and plan or attend lunch parties instead of dinners. Heavy dinners will show well on the weighing scale next day. • However hectic your schedule may be during this festive season, do not forget to exercise. Walk as much as possible to burn off extra calories. • Reserve your sweet serving for the last in the meal.....you would be mostly full with the meal and you can't eat much!!!. • If you feel you have had quite some high calorie stuff for the day then try and keep your dinner off carbs!!! Have some soups and salads.